The Nikon Coolpix S6150 fits into the S (Style) range of digital compact cameras. Featuring a 7x optical zoom, Nikon ED glass, a 3 inch touch-screen with 460,000 dots (153,333 pixels) and an EXPEED C2 processor, the S1650 shapes up rather nicely and it looks pretty good too. 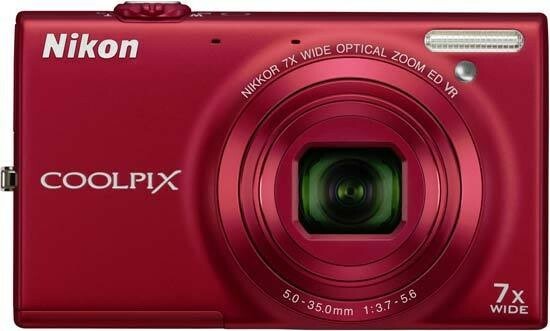 Aimed at the point and shooter that wants good looks and a decent specification, the Nikon Coolpix S6150 costs around £160 and is available in black, pink, red and purple. From the front, the Nikon Coolpix S6150 doesn't look anything special. It's a simple box-shaped camera with a slightly bulging lens barrel to house the 7x optical zoom. The slim flash sits just to the top right of the lens as you face it which could get fingers slipping over it while taking a picture. On the back, the touch-screen has managed to eradicate all but three buttons which are located to the right side. A small thumb pad is just above to rest it while you're shooting. It would be nice to see the zoom on the screen like we saw with the Nikon Coolpix S100 but instead the S6150 has a small rocker switch wrapped around the shutter release button. The power button is sat next to the shutter release and lights up green when the camera is switched on. One of the buttons on the back is the direct video button which will begin recording video around a second after you press the button. The reason for the delay is so the S1650 can focus and meter before it starts. Zooming is possible during filming and while the motor does make a noise that can be captured by the microphone when it's quiet, it's insubstantial and in a normal environment shouldn't impose at all. On the top right shoulder facing the back of the S1650, the camera has a USB and HDMI port for downloading either pictures or video. The S6150 does record video in HD but at 720p, it's not Full HD which is a shame. One advantage of having the ports on the top of the camera is that you can charge the battery in camera directly through the USB. This is great for travelling photographers or when you're away from a mains socket for a long period of time. Remember you don't have to tell the camera that you want to charge via computer - it does it automatically - but you can turn it off if necessary. Continuing with the buttons, the middle one has a green camera on it and this is for choosing the shooting mode. You have three options: auto, scenes and smart portrait. It would be nice to see a more manual option instead of the smart portrait which can be put in the scene menu. Touching the option will enable it. Once a mode has been enabled, there are two small arrows on the screen; one on the bottom and one to the left side of the screen. The bottom arrow brings up a screen that allows you to access resolution, touch-screen options, ISO, drive modes, white-balance, video, video focusing modes and wind noise reduction. There's also a spanner icon to go into the set-up menu. Usually, set-up menus are pretty large with lots of stuff to look at and can be quite over whelming. Nikon have simplified it by stripping lots of stuff out or bunching it together. The lists are also thumbnails so they're easier to press and it also makes the screen more welcoming. The arrow on the left brings up more often used features including flash, self-timer, macro and exposure compensation. This new menu system is certainly easier to navigate than older Nikon menus but it leaves a feeling of sparsity, as though not as much has been put into it. It also reduces the option of expanding your photography because there isn't as much stuff to change. In all likelihood, a lot of thought has gone into that before the decision was made. That being the case, the Nikon Coolpix S6150 isn't aimed at photographers on the look-out for a pocketable extension of a DSLR. It's a shame because the zoom is impressive enough at 7x optical (28-196mm in 35mm terms) and the S6150 certainly looks the part. Picking the Nikon Coolpix S6150 up, it feels solid enough and there's a satisfying weightiness to it. Not the weight that will prey on your mind as you carry it around, but will give you peace of mind that it can't be stolen by light fingered passers by. The body is metal but covered in a rubbery coating that feels nice and gives a bit extra grip. On the bottom, the battery and memory card share a compartment which has a plastic lid. On its own, we don't think it would be very strong, but there's a metal plate under it to add strength. It works because there's only a little bit of play in it and the hinges seem strong enough too. The Nikon Coolpix S6150 is SD, SDHC and SDXC compatible for ultra large memory capacities. It would be nice to have seen USB 3.0 for speedier transfer of a massive amount of pictures, but given the price point, we may be asking too much. The touch-screen could be more responsive. It does obey your commands but you have to be a bit forceful with it. We also found that the position of the arrows to bring up the menu systems was too far into the edge and using just a finger wouldn't bring them up, instead we had to use a fingernail. We tested the Nikon Coolpix S6150's shutter lag a number of times. In fact, we tried it more than usual because of the results that we got. Normally, a digital compact camera will provide a pre-focused result of around 0.08 seconds. The fastest we got the S6150 was 0.25 seconds. Generally, the results were around 0.30 seconds. Add a flash and you're looking at a delay of nearly a second. We nearly didn't test it without focusing but that came in at around 0.5 seconds. So it takes around a quarter of a second to focus which isn't bad. Getting the camera to focus can be an issue, though. If the camera is doing anything else such as looking through the menu or if it's in playback mode, the S6150 doesn't work like other compacts whereby you can press the shutter button half way and it will come out of what it's doing and start to focus. Instead, you have to exit what you're doing by pressing a different button or by pressing the shutter release, then you have to focus after that. It sounds picky and maybe it is, but it's the small things that will gnaw away at you if you own this camera. The Nikon Coolpix S6150 has a drive mode located in the bottom menu. We managed to get 12 pictures in a 10 second time period averaging 1.2 fps (frames per second). There are three focusing modes on the Nikon Coolpix S6150 and they're used to control the touch AF system. There's the touch shutter, subject tracking and touch AF/AE. The first and last are the same as each other with the exception that the latter doesn't take a picture automatically. Subject tracker will lock onto the area you've touched and keep with it even if it or the camera moves. They all work very well, finding no fault with them throughout the test. One of the features to be stripped from the camera in order to make it easy to use is the metering modes. On a compact of this specification we expected to see up to three different metering modes but there are none. Still, the camera will use it's segment metering system which is the standard on digital compact cameras these days. It works very well but then Nikon metering always has. In playback, there's quite a decent amount of things to do on the Nikon Coolpix S6150. Pressing the up arrow at the bottom of the screen brings the playback menu up. There's the option to select favourites, create a slideshow, lock pictures, direct print, edit and draw. To the right of the screen, you can add a number of stars to the selected picture to create a rating for it. Nikon's new cameras have in-camera charging systems so you can charge directly from USB or connect the USB cable to a mains plug to charge from a socket. There's also a wrist strap and HDMI to analogue (red, yellow & white) video cable which kind of defeats the object. As soon as this cable is used, the digital quality is lost through the analogue leads. The included booklets are thick but multilingual. There's a safety guide and quick start booklet. The full instructions are on the provided CD and a second CD contains Nikon View NX2 for downloading and tagging your pictures.